Sony's release-a-thon at CES has continued apace, with the launch of its new powerful Vaio F series laptop, which claims to offer both a high end multimedia experience and powerful office performance too. 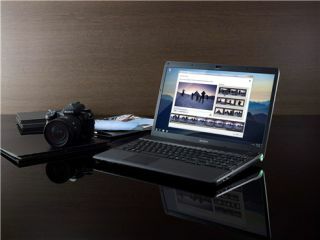 Running Windows 7 Home Premium, the laptop has a slick black chassis and a glossy Full HD 16.4-inch display. It's got the power too – specs include an Intel Core i7-720QM processor, 8GB of DDR3 SRAM and a 500GB hard drive. There's also an NVIDIA GeForce GT 330M graphics card packed in too, with 1GB of RAM powering the pixels. It weighs a fairly hefty 3.2kg, so it won't be for everyone's bag, but with a Blu-ray drive and Dolby Home Theater v3 for cinema-style surround sound, we can imagine it might just stay on your desk anyway. We're still waiting to hear about UK pricing, but it's been given a UK release date from the online Sony store from the end of January 2010.